Place chicken in crock pot. Finely dice onion and garlic in food processor. Add remaining ingredients except some or all of the mushrooms, if you prefer some or all of the mushrooms to remain sliced. Briefly mix in food processor to maintain some texture of veggies. Stir in sliced mushrooms, if desired. Pour half of sauce over chicken in crock pot. Cook on high for 4-6 hours. Heat other half of sauce on the stove top until veggies are tender. 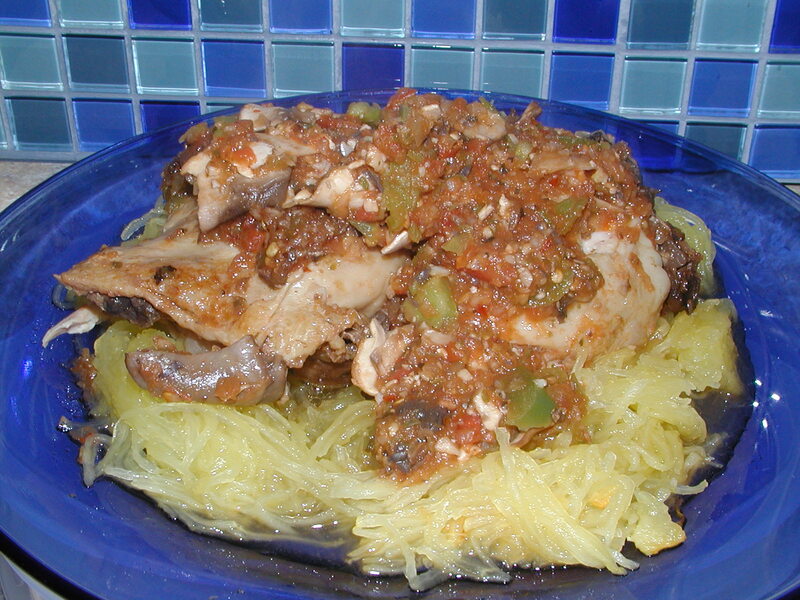 Serve chicken on a bed of spaghetti squash noodles topped with extra sauce. Enjoy!